Airport Car Hire Network provides discount car rental. We compare car hire prices at Rotterdam Airport for you, and bring you the best deals from the following rent a car companies at Rotterdam airport Hertz, Avis, Budget, Sixt, Europcar. One way rental available on selected hire cars. Pick up your car in holland and drive anywhere in Europe, Spain, Italy, Croatia jsut to name a few. Information Desk: Tel +31 (0)10 - 446 34 44. Rotterdam Airport Shop is to be found in the departure hall, and offers an extensive selection of products at competitive prices. In addition to travel necessities and gifts, the shop also sells perfumes and other cosmetic items, tobacco, liquor, china, crystal, jewellery, clothing and other luxury goods. Rotterdam Airport has excellent restaurant facilities for travellers and visitors to the airport. In the departure hall, the luxury self-service restaurant De Basseri offers a very varied assortment of refreshments to passengers who have already passed through security control. The attractive grand café/restaurant Horizon, located on the first floor of the central hall of the terminal building, is accessible to all visitors to the airport. The RET Airport Shuttle nr. 33 runs very frequently between Rotterdam Central Station and Rotterdam Airport. From Rotterdam Central Station you can travel by train directly or with only one change to a very large number of stations in the Netherlands or you can take trams, busses or a metro (underground) to travel within Rotterdam and the region. All parking areas are situated within walking distance of the airport terminal. Fill in when you wish to drop off and pick up your car. A personal parking advice with the rate for the cheapest parking place will be determined. Looking to enjoy some shopping in Rotterdam the main shopping areas are Lijnbaan, Meent, and Hoogstraat, and the shopping mall at Alexandrium. Enjoy a harbourside walk in Rotterdam, taking in the wonderful architecture along the walk and the harbour activitiy. Take in some of Rotterdams Gardens and Parks at the Trompenburg Arboretum, Botanical Gardens, Historic garden Schoonoord, Museum Park & Rose Garden, Leuvehoofd Park & Boompjes Waterfront. Looking for a night out in Rotterdam take in some live entertainment at the beautiful New Luxor Theatre, Zuidplein or Rotterdamse Schouwburg. Why not travel to the town of Delft from Rotterdam in your rented car, to explore this picturesque town of Delft made famous for the renowned Delft Blue pottery, Royal Delft. Delft like the other towns and cities in Holland is blessed with its canal network and its charming old city centre and street. You can continue on to The Hague and take in any number of its museums, The Royal Picture Gallery Mauritshuis, The Historical Museum of The Hague, Louis Couperus Museum, Van Kleef Museum and Distillery, Jan van Goyen House. Vist The Hague outdoor market and take in the colours and activities or enjoy shopping on Grote Marktstraat and Frederikstraat. The Hague is also where you can enjoy the beach at Scheveningen and its wonderful pier. Regardz Airport Hotel Rotterdam, Vliegveldweg 59 - 61, Overschie, 3043 NT Rotterdam Regardz Airport Hotel is situated along the Rotterdam The Hague Airport and the A13 motorway. There is a direct connection to the city centre and Rotterdam Central Station. This 4-star hotel has rooms and suites. All rooms have free Wi-Fi, a flat-screen TV and coffee and tea facilities. The luxurious rooms and suites offer more space and comfort. 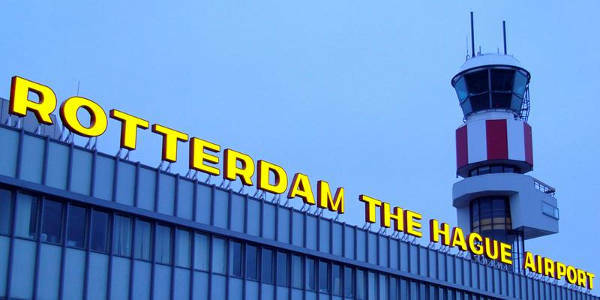 Regardz Airport Hotel Rotterdam is located 15 minutes from the city centres of Rotterdam and Delft. You can walk and make bike tours in the nature reserve Park Zestienhoven. Inntel Hotels Rotterdam Centre, Leuvehaven 80, Stadscentrum, 3011 EA Rotterdam Inntel Hotels Rotterdam lies at the foot of the Erasmus Bridge. It offers free entrance to Wellness Club H2O and modern accommodation with spectacular views and free Wi-Fi. The Wellness Club includes a swimming pool, Finnish sauna, Turkish steam bath and tropical rain shower. The Life Fitness Gym has professional State of the Art Life Fitness equipment.The restaurant has views over the skyline of the city and the Erasmus Bridge. From Inntel Hotels Rotterdam Centre you can easily use the tram and metro that stops right in front of the hotel. The harbour and Cruise terminal is a 15-minute walk. Novotel Rotterdam Brainpark, K.P. van der Mandelelaan 150, Kralingen-Crooswijk, 3062 MB Rotterdam Novotel Rotterdam Brainpark is a comfortable and modern 4-star hotel, located 10 minutes by car from the city centre. Hotel guests can park their car for free at the hotel. The spacious hotel rooms offer excellent comfort and have a large working space. Each room has a private bathroom and coffee and tea facilities. The rooms are quiet and well-kept. The Novotel has 2 computers in the lobby that offer free internet access. There is also a special play area for children which includes an Xbox console. Bilderberg Parkhotel Rotterdam, Westersingel 70, Stadscentrum, 3015 LB Rotterdam Bilderberg Parkhotel Rotterdam is ideally situated next to the museum park, only 15 minutes' walk from Rotterdam Central Railway Station. The hotel offers spacious rooms and a wholesome breakfast buffet. The proximity to Rotterdam Central Station makes it possible to discover the areas around Rotterdam as well. Van der Valk Hotel Rotterdam - Blijdorp, Energieweg 2, Noord, 3041 JC Rotterdam Conveniently located just 2.5 km from the city centre and Rotterdam Central station, Van der Valk Hotel Rotterdam - Blijdorp provides modern decorated accommodation with free parking. Van der Valk hotel Rotterdam - Blijdorp enjoys a natural setting in Roelof Langerakpark, next to the Blijdorp Zoo. Guests can choose from a variety of high-quality accommodation with modern facilities. The hotel is just 5 minutes’ drive from Rotterdam The Hague Airport and 200 metres from the A20/A13 motorway. It is also well-serviced by regular public transport to the city centre and airport.